If this month features the Alberqueque "KlezmerquerQue", then next month we get to the letter "B" and both Berkeley and Boston have their festivals. This year's Boston Festival has a diverse, dynamite lineup, and it's local, so I got to go have lunch this week and hear Jim Ball and Joey Baron tell us about it. I'm psyched. What I find most interesting is how much the Boston Festival is tied into the area's synagogues. In most communities, most of the outreach of an event like this is to unaffiiliated Jews. Here, I would guess that it's the opposite. Both support and publicity seem to focus on each synagogue and minyan in the area. One place where that attitude is exemplified is the tie-ins to the Frank London-led event, "Divine Sparks," at Berklee performance center on Mar 12. This is an exciting, avant-garde approach to hazonos as exemplified by Frank's work with Cantor Jack Mendelson and others on his CDs, Hazónos (2005) and Invocations (2000). But this festival doesn't stop there. The Friday night prior to the event, at services in four Boston-area shuls, you can listen to the visitoring cantor who will star in that event, of your choice. Not bad. Check out the Festival calendar, now online, and start picking up tix asap. 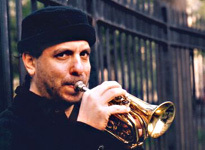 No telling what's going to sell out how quickly, but from Cantorial to Klezmer to Sephardic music to hip hop or a capella music, there's a lot going on. 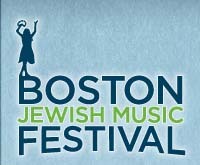 Check it out at bostonjewishmusicfestival.org. See you there.